Jules Verne’s classic underwater tale. After much fruitless searching, the monster is found, and the ship charges into battle. During the fight, the ship's steering is damaged, and the three men are thrown overboard. They find themselves stranded on the "hide" of the creature, only to discover to their surprise that it is a large metal construct. They are quickly captured and brought inside the vessel, where they meet its enigmatic creator and commander, Captain Nemo. This experience probably would have been much more enjoyable with a different reader. Verne can already be a little dull especially once he starts going off on his lists of every creature that swims, floats, or crawls through the ocean, or the average salinity of any given body of water, but Husmann's monotone almost metallic reading made it almost unbearable. I questioned several times if it was a robot reading but the occasional wheezing assured me there was in fact a human behind the mic. The pauses between chapters were also incredibly long, so much so, that I would check to see if my player had stopped every time. The story is a classic but not my favorite. 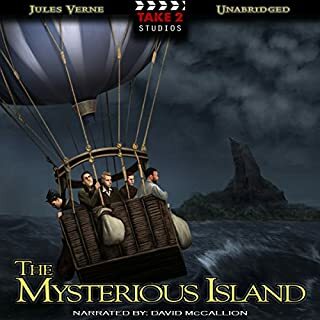 If you must read a Verne book I suggest "The Mysterious Island".If you must read this book I suggest any other recording. A classic that everyone should read. This book was $2, and well worth it. I read the book 20 years ago, but decided to listen to it again. Buy the book and don't use the credit though. It will be the best $2 you spend on audible. Written over 100 years ago it accurately predicts submarines, deep sea diving and other technologies. The narration by Peter Hausmann is great and the story can't be beat. I could write more, but at $2 try it for yourself. 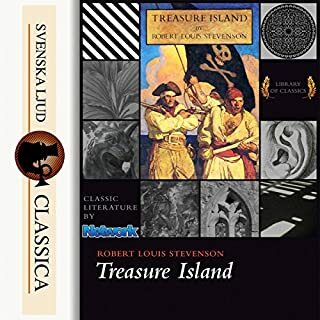 I tried very hard to like this audiobook, because it uses the best public domain translation of Verne's masterpiece currently available: the first version of F. P. Walter's translation, which is available on Gutenberg and elsewhere. (Walter has since re-translated the book in a copyrighted anthology called "Amazing Journeys: Five Visionary Classics." This anthology is THE place to start if you're just getting interested in Verne. 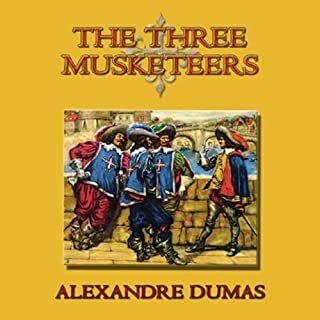 It's available from Amazon in both paper and Kindle versions and includes many illustrations from the original French editions.) Walter's translation is clear, accurate, and idiomatic. I would love to see a different reader tackle Walter's translation - or, alternatively, to see Husmann have another try at this one: he's got a good, strong voice; can clearly distinguish between the different characters; and would benefit greatly from a more natural delivery. (Come to think of it, maybe what he was missing was a good director.) Doing this book is clearly a labor of love for Husmann: at the time I wrote this, the "list price" was less than $2.00. 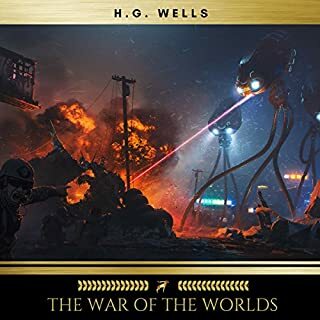 Actually what I would REALLY love to see is someone tackling all five of the novels in the anthology: this one, "Journey to the Center of the Earth," "Around the World in 80 Days," "From the Earth to the Moon" and its sequel "Around the Moon." 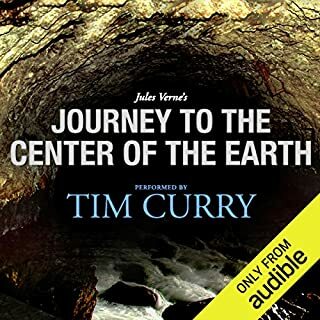 Verne is a wonderful writer, and so far the audio versions of his work have been kind of piecemeal. If you could sum up Twenty Thousand Leagues Under the Sea in three words, what would they be? When they went for their first walk underwater to the forest. The way the reader brought excitement in his voice when talking about the wanders the professor was seeing piked your interest so much that you had to stop the book and go look up pictures of what the book was describing. And that caused the book to come even more to life. And the walk through the sunken city of Atlantis. The description of the volcanic active lightening up the city. It made me want to take the time to wonder among the ruins described. Which character – as performed by Peter Hussman – was your favorite? The Canadian harpooner - Peter's voice inflections brought alive the surliness, frustration and anger. You didn't just hear the words you felt like the real person was there and you were witnessing the actual scene. Most definitely. And I will listen to it again. I knew that movies aren't as good as the book and that Disney basically rewrote most of the stories they made. But they left so much of the best stuff out of the movie that it was a real surprise to actually listen to the book. I hated to stop to go into work each day. And I would take the country way home so I could drive slower to be able to listen longer. While the Nautilus was going through the Mediterranean, I was driving though the ice and snow. The story became so involving that when I parked, it was like going into a dream world instead of reality when I got out to face the walk through the cold parking lot to work. I thought that they character were the best part because they seemed to each be so unique. their interactions with each other is unparalleled and enjoyable in most instances. This book is a must have but it does have lots of details concerning things that are not necessarily relevant. 40% adventure on the high seas, 60% an autistic man describing every fish he sees in in exhaustive detail. while on a submarine. for months. I've started re-reading many of the classics that I haven't read in 20+ years. This one I had actually never read and might be the reason for my adolescent disdain for reading. Had I read this, I probably would've read everything instead of being forced to read "classics" via the public school system. Other classics have been thoroughly disappointing (e.g., The Time Machine), but this one is timeless. Although a modern day youth might mock some of the science, much of it is still relevant (especially as we seem to know more about space than our own oceans). How could Professor Aronnax not accept Captain Nemo's invitation aboard the Nautilus. The alternative death sentence aside, I would jump at the opportunity, even knowing the circumstances put forth by the Captain. loved this very very interesting. great fun. have been meaning to read this for years well worth it and better to listen! I confess I've not yet finished the book. but five hours and 16 chapters in I've lost patience with it. detailed descriptions are all well and good. but when a good five minuets or more is spent on describing almost every single item that falls into his line of vision. almost 10 full minuets are spent on a conversation between Consail and Ned land as they discuss the classification of fish and describe the selection of fish to be seen from the submarines windows. no character development, very little character interaction a whole lot of talking and explaining about the ship. (which if your into the nitty gritty details of how things work might be for you) and No events of real interest. The performance was good, no complaints there. I have read this and didn't remember the long lists of creatures and the classifications.. or all the position coordinates... I must have sped over them when reading... you can't do that with this medium.. It makes you appreciate the way it was written better..
To me the narration seemed very good. 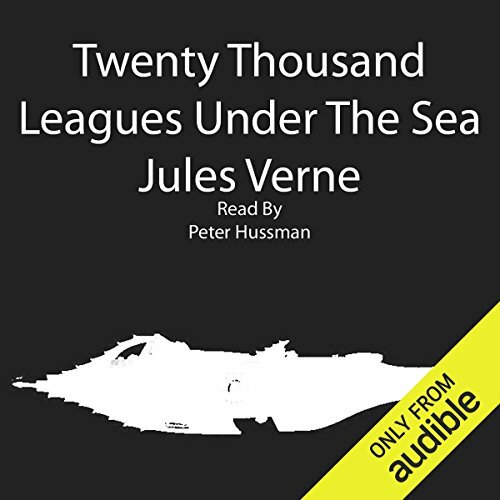 Not flat like some can be nor over the top..
Would you try another book written by Jules Verne or narrated by Peter Husmann? I would try a book narrated by Peter Husmann again. 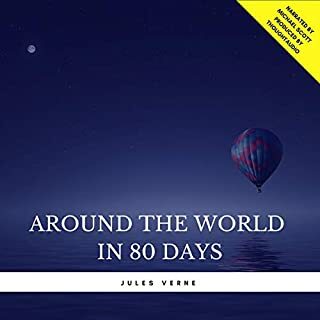 I read Around the world in 80 days which was fine, but this one was mostly long lists of things. I would cut down on some of the lists of things. What three words best describe Peter Husmann’s voice? Was Twenty Thousand Leagues Under the Sea worth the listening time? No but once started I wanted to get to the end. I don't like giving up on a book. I couldn't recommend it in any way. I say dated not just because many of the core concepts have been realised and surpassed, but because the vivid descriptions of marine life themselves have also become somewhat common place in the light of documentaries. I'm not saying there is no place in literature for descriptions of the mundane, daffodils are common place and yet Wordsworth managed to do them justice :) However, the descriptions here are of a scientific nature, not a poetical one. Having said that, the character of Nemo is still enigmatic and there is some enjoyment to be had from that, but overall, I felt the book could have been shortened to half it's length and still held all of it's enjoyment for me. This was a cheap buy - and I can see why. The reader's delivery grates on the ear and becomes annoying after a very short time. I think the main problem is that his style is to over-emphasis just about everything he says, and his voice goes dramatically up and down during every sentence. I'm going for a refund! Did Peter Husmann do a good job differentiating each of the characters? How? o for seemingly the last year I've been listening to the audio book 20000 Leagues Under the Sea.... walking round the shops. At lunch time . Driving my car. ..I thought it would never end!! But it has..just now!!! I've learnt a lot about classifying fish. And how to sink boats and kill whales (often for fun) I found Professor Arronax deeply irritating and his man servant Conseil equally so. However it is a classic. Some of it was pretty hard to get through and I took a couple months-long intermission to read other stuff. But inevitably there would always be a delicious chocolate chunk waiting for me in one of the adventures or situations when I came back. They experience amazing places and thrilling events, just sometimes they'd be separated by a bland dough of overly detailed classifications and descriptions of marine life. Aside from the sometimes dull pacing, my only other gripe is with how the author sometimes seemed to free the protagonists from a situation with somewhat of a Deus ex machina. It doesn't happen often but it did leave a poor taste in my mouth when it did. TL;DR: if you're fascinated by the possibilities of what the depths of the oceans could contain, and don't mind extraneous detail here and there, you won't be disappointed.